As of this morning the month of May is officially over and with it goes the Newbie Blogger Initiative for 2015. I have some mixed feelings about the 2015 run, but in the important ways it seemed like a success. The good folks at MMOGames had offered me the ability to highlight NBI specifically during my “bonanza” blogging round up. The problem being there was a pretty massive falloff in the amount of blog content after the first two weeks. I still highlighted the Talkback Challenges but found it quickly hard to make an entire post made up of nothing but Newbie Blogger Initiative content. So I guess the question I am trying to answer is what specifically caused this cooling effect in the posts? Generally speaking in past years if anything there is a ramping up with new people joining the initiative as the month goes on and folks having a burst of activity right towards the end. That didn’t really happen this year. That said any program that gets new people into blogging is a success in my book, and as I have said many times our community needs a constant fresh infusion of people willing to add their spin to the conversation. Here is a relatively final list of the Class of 2015, so you should absolutely add these blogs to your blog reader and check in on their progress every now and then. I’ve had a lot of questions and commentary asking me to do the Blaugust event again this year, and since I had been mostly coy about this… as of this morning I am committing to making it happen once again. For those who did not participate in the process last year, or were not around the blogosphere… Blaugust is a festival of sorts devoted to the regular creation of blog content. Above anything else I have become known for my mission of posting something every single day on my blog. Granted there are lots of bloggers who do this and should be celebrated. I know personally I saw a massive spike in my readership when my content deliver became for lack of a better word “predictable”. The idea for Blaugust is simple… post at least one post each day during the month of August. That is thirty one days of posts, and if you win the competition you get the pride of being able to display one of our badges on your site showing you “won”. Additionally last year we had various prizes to give away and I am sure that will be the case again this year. The big thing that is going to have to change this year is I am going to have to wrap some tools around the process. My life during the month of August revolved around making sure that everyone had gotten in their blog post each day. Where this got squirrely was when I factored in our Aussie bloggers who were blogging from the future, and even our six hour offset European bloggers were a challenge to keep track of. What is going to happen instead is that in order to participate you will need to submit each blog post through some sort of a form that is going to keep track of if you posted for a specific day. This should help out some of the folks that would end up posting after midnight, when they really intended the post to count towards the previous day. The important thing is the regular creation of content, not necessarily technically when you post it. We have a two month reprieve, but I wanted to get notice out there that I would in fact be doing Blaugust yet again, so that folks could start psyching themselves up for the “marathon”. 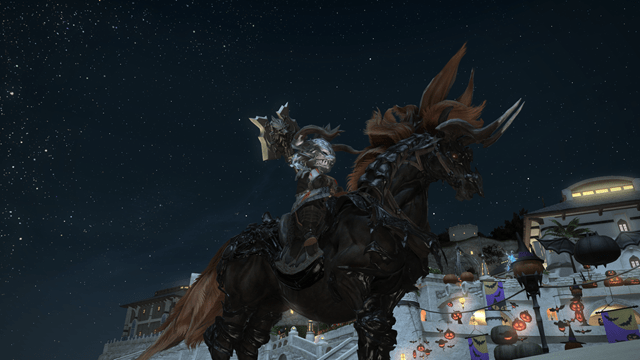 This weekend I managed to push my crafters in Final Fantasy XIV to level 21, which gave them access to a whole new set of gear and allowed me to get rid of the other set I had been using. I figured this was as good of a place to rest for a bit as any. With only eighteen days until the head start I don’t figure there is a real chance that I will actually be able to push my crafters to 50. With that in mind I opted to start working on my Rogue a bit this weekend. For awhile now I have been torn as to which class to push next, and I have juggled both Monk and Ninja. What finally pushed me over the edge to Ninja was when I managed to get the Malignant Mogknives to drop awhile back. As such this weekend I managed to go from level 28 to almost level 34 which is not the fastest progress in the world but still acceptable. I figure I will speed up significantly in a few levels when I can realistically start doing Coerthas for FATEs. For the time being I am running FATEs in the Costa Del Sol region while queuing for whatever the max level dungeon happens to be. Currently that is Brayflox Longstop which also gives me the opportunity to pick up the couple of pieces of the Infantry set I had been missing. I have no idea if I will manage to push up Ninja to 50 before the expansion, or if I will return to Crafting madness, but in either case I certainly have plenty to do to keep me engage until things launch. I really should devote a weekend day to the Post Moogle quests because I really do not think they would take that long. I did not end up with as much play time this weekend as I thought I would, otherwise I probably would have done precisely that. One of the things that I think is amazing is that as a Free Company we are still bringing in new people. Sure it has slowed down from the initial burst of players, but over the weekend we added another five members or so through our extended networks. This gives me hope for Heavensward and our ability to get things like the guild airship. I am certainly excited about the prospects this expansion has for our group. Yesterday a good friend and I were having a conversation and she said a certain phrase I have heard over and over before. “Everybody has an agenda”, which is something I have just taken at face value in the past. But this lead me down a line of thought that I had not actually travelled before. If everyone out there has an agenda… and this is pretty much just accepted common knowledge… then what does the world think my agenda is? I am out and about in the community on a daily basis interacting and mingling… but I wonder how many people think I have some grand ulterior motive? This lead me to assess what my actual Agenda is, and the only thing I could come up with is something along these lines. To which I was immediately accused of being a cult leader… but really isn’t every good group at least slightly cult like? While I won’t be trying to convince everyone to wear matching tracksuits so that we can ride a comet… I am trying to convince people that it is cool to hang out with friends and share these games we way with one another. I feel like all of this starts with the fact that I grew up the only child of extremely busy parents. I am exceptionally good at entertaining myself, but I always felt jealous of the kids that had close neighbors, or siblings to play with. These days I try and surround myself with as many awesome people as I can find, and build a giant extended family of sorts. Being the whirling dervish of social media interaction that I am sometimes… folks could get the wrong impression that I am “up to something”. However in truth, I am just looking to hang out with interesting people. I approach every interaction like this person could be a new life long friend, rather than someone who could bury a dagger in my back. Last night I had but one mission to accomplish. Upon logging out Tuesday evening, I was sitting roughly one third of the way into 49. White Mage has been the hardest class for me to level in Final Fantasy XIV in part because it is the least like the sort of character I normally play. I set down the path of leveling a Conjurer so that I could become a Paladin, and then just kept up with the process thinking that I had 2 tanks, 1 ranged dps, 1 melee dps… and the only thing I was really missing role-wise was a healer. Originally I simply kept leveling Conjurer so that I could get to level 34 and get Stoneskin… which is extremely useful for soloing as a Paladin. From there I figured I was close enough that I would go ahead and push for 50. Additionally over the course of running so many dungeons and casual raids in this game, I had accumulated quite a bit of healer gear simply by greeding on it. The final incentive came when I needed to spend down some of my soldiery tokens and opted to go ahead and purchase the level 110 White Mage weapon pictured in the image above. As a result of all of this I got on last night, ran a guildhest, and two low level duty roulettes and finally reached my level. After sifting through my bags I managed to equip enough gear to get me to level 85, which is not too shabby gear wise. The hardest part of course was figuring out what my White Mage outfit would end up looking like. I finally settled on the Loyalist Bilaud dyed Morbal Green, with gloves, pants and boots from the Acolyte set and the awesome shades Cylladora made for me ages ago. I felt like I needed to go with something non-traditional since the white mage 110 weapon is a giant war mace… and I happen to like it. The end result is my take on a final fantasy battle priest, which is fitting considering I seem to spend as much time casting Stone II as I do healing. Largely I am just happy this push is over, because leveling as a Conjurer/White Mage is slow going. Chewing through every mob simply takes more time that I am used to from playing anything else. 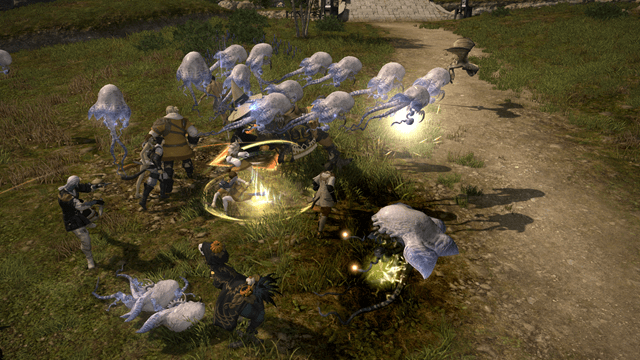 My only suggestion for future CNJ/WHM players… run it up first before you realize just how slow it kills things. At this point I am not sure what my next Final Fantasy XIV project will be. Right now my Rogue is 15 and my Monk is 33. Both classes are extremely fun to play, but I think I will probably spend more time at max level playing the Monk than I ever would the ninja. The Mudra system seems interesting, but it also seems like something that is extremely fiddly and likely to just piss me off… especially combined with just how “weak” survival wise the ninja ends up feeling. Mostly I am biased against Ninjas after spending so much time running raids and dungeons with random ones. Ninjas seem to either take no damage at all… or all of the damage at once. Healing Ninjas as my White Mage has been the bane of my existence over the last few weeks, and I really don’t relish putting anyone through that. So you would think the decision is all wrapped up and I would be leveling Monk right? Well not quite that easy. 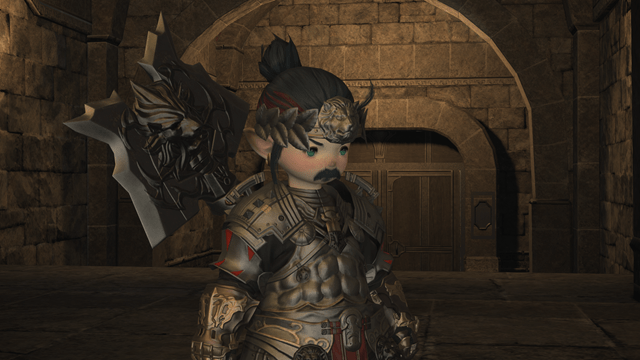 Up until this point I had felt like the pugilist/monk play style was far less interesting than say a Dragoon, which is the reason why it has been lagging so far behind my other melee classes. On top of this… almost all of their gear sets look silly to me. If I played a monk, I would ultimately be stuck wearing the Infantry set for the rest of his life, because I really have not cared for any of the other sets I have seen. There is a set from Labyrinth of Ancients that looks amazing, but it is also one of the most hotly contested item sets in the game. 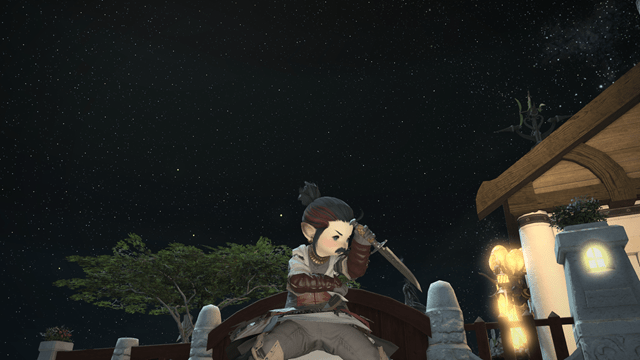 Last night I ran a guildhest with an adorable Lalafell ninja… which got me thinking that since my goal in playing a Lalafell is to be adorable all the time… maybe Ninja is in my future. I guess time will tell which one I actually start playing. In any case I would love to finish out my Disciple of War classes so I can clean all of that gear out of my banks. Months ago I said I would like to hit 50 on all classes before the expansion, and with my raid schedule in World of Warcraft that is never going to happen. Maybe I will set that goal a bit lower and target finishing out all of the Disciple of War classes before the expansion. Yesterday was seriously one of the hardest days to get through I have experienced in a very long time. 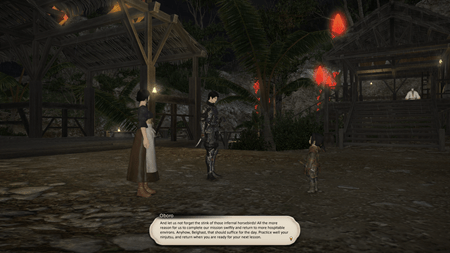 When I troddled off to work the Final Fantasy XIV servers were up and back from maintenance, and as I worked all day long I would see little tid bits of information here and there about just how great this patch ended up being. For the uninitiated yesterday was the release of Patch 2.4 “Dreams of Ice” which introduced a ton of new content, not the least of which is the Shiva primal encounter that the patch is named for. It is truly staggering to think about the amount of content that has been released for this game since launch. Roughly every quarter players get a major patch the size of 2.4, that generally introduces 1 to 2 new primal fights, 3 new hard mode dungeons, new main story quest chain, new Hildebrand story chain, new gear, new glamour bits, new hair styles and in this one they even introduced a brand new class and job combination in the Rogue and Ninja. On top of that we seem to see at least one minor content patch each month, the last one added personal housing so still no slouch content wise. So when you contrast that with other games that can go six months to an year without any new content, it is phenomenal. This patch however is not with its controversies. Up until this point everything that has been available in game has either been earned doing in game things, or through subscription rewards. The game has some pretty insane subscription rewards that include tons of interesting mounts, pets and cosmetic items. This patch however introduced the cash shop, and they sprinkled a few really awesome items on it, not the least of which is the Slepnir mount you can see me on in the above picture. There is so much gnashing of teeth over the fact that this mount is $24, and the mini-pets on the store are $5 each. At this point however a cosmetic shop just seems like the status quo. One of the more interesting things they are doing with it is that each year there are unique rewards for completing holiday events. To allow players to get previous items they are putting the older items up on the cash shop for a minimal fee. Thankfully I have managed to pick up most of the holiday items I might want, but it is nice knowing that I could potentially get the items I missed during the Christmas events. Though out the day yesterday I thought about just what I would try and tackle that night when I got home. My focus was going to be on unlocking the three new hard mode dungeons so I could be ready to run them as the rest of my free company became available. I could always queue for the dungeon finder and take my chances with strangers, but I would really rather experience this content fresh with a guild group. There is something awesome about having to reason your way through the fights for the first time as a team, even if you fail to make the 90 minute timer. 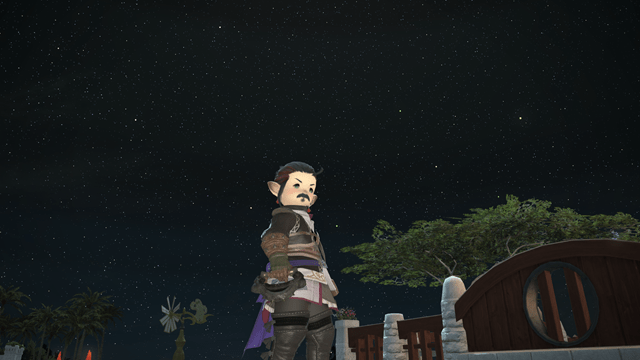 Even with my laser focus… there are certain things any proper Lalafell must do. While wandering around Uldah I bumped into Sagacyte Luxaloix and before I knew it we were dancing the manderville as is Lala tradition. 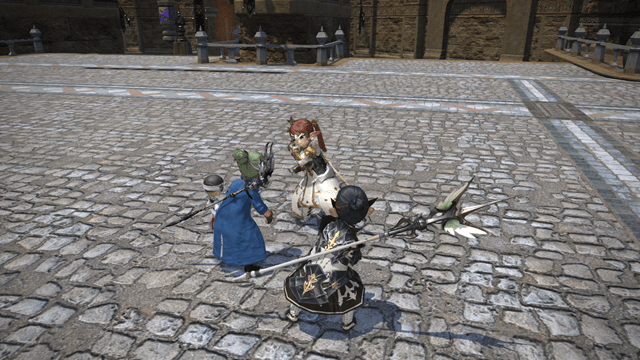 Moments later we were joined by a friend of his Lirrianna Darkholme and there in the middle of the streets of Uldah we had an impromptu Lalafell dance party. We were all very busy, but traditions must be observed and social graces administered. 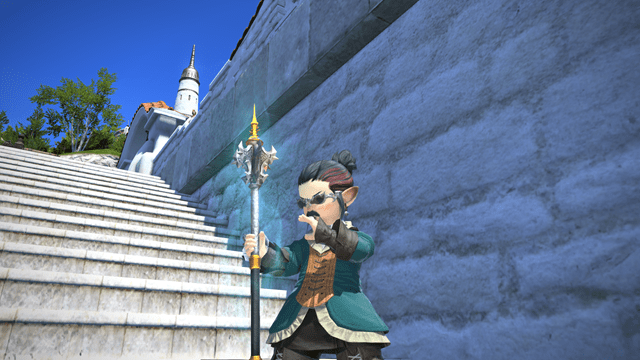 For those looking into unlocking the new content, there is an excellent blog post from a Lalafell blogger I just stumbled onto this morning talking about the start of each of the new content items. After we finished with our customary dance party, I went on about my business of unlocking the dungeons. Both Sastasha Hard and Sunken Temple of Qarn Hard were relatively simple to unlock, with fairly straight forward go and talk to this guy then go to the dungeon style quests that start in Mor Dhona. For Snowcloak however it is yet another quest tied deeply into the main storyline. So I set forth beginning that chain and two and a half hours I had reached a point where I was standing at the gates of the new Snowcloak dungeon. When they put in new story content… they put in a lot of story content. This however is what makes the game so damned phenominal, is that they keep moving the story forward and giving you a reason to care about the characters you meet. As a friend said last night, it is not so much that your character is the “big damned hero” but more that your character is the social glue that keeps all of the good guys working together. You are the one person they trust due to past interactions, and the lubricant to make things happen when something goes wrong. I did not actually intend to start a rogue last night, but I ended up picking up a new quest in Limsa Lominsa near the Aetheryte crystal that just happened to lead me to the guild. I figured while I was there what was the harm of going ahead and unlocking the class. The server has quite literally gone insane for Rogues and Ninjas. 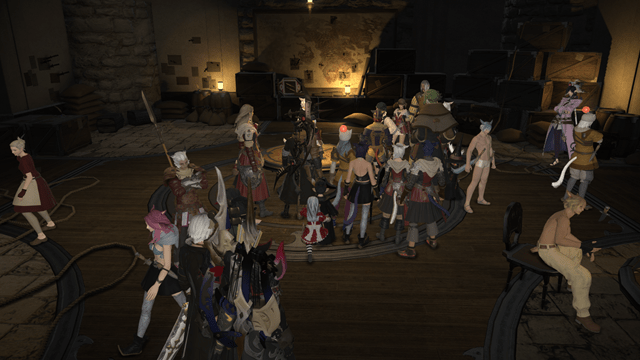 The above photo is a scene from inside the Rogues guild in Limsa Lominsa, and there are even more folks milling around outside of the place. The Fisherman’s Guild port has never seen this much activity ever, and really the guild does a pretty piss poor job of disguising itself with all these people swarming around it. So while I picked up the Rogue I had no plans to level it until I got bored waiting around on a group to happen. Last night myself, Tam and Ash hatched a plan to make the guild some money that we could stockpile for our guild airship. Wanderers Palace is the bottleneck for the Relic weapon quest, in that you need a bloody weapon component to craft the precursor weapon for the entire quest chain. For most classes these are common enough that you can pick up a high quality version of the weapon for 20-30k gil and just be on your way. This means that all of these newly minted rogues will need one eventually so that they can start down the Relic quest chain. As you can see there are only two currently available on the Cactuar market system and they are holding steadily at 300k gil each. The finished weapons are holding steadily at 500k gil a piece and both are in high demand. So we thought we could run Wanderers Palace a few times and if nothing else stockpile some blades for the guild, and at best pick up a bunch to sell on the market while the demand is high. We struggled to find a fourth, as there were a handful of folks available… but they all appeared to be either AFK or in a duty already. So while we waited around for something to happen… I decided to start working on the rogue. Overall the class is really damned fun to play, and in part it is the animations that make it so enjoyable. You feel like a whirlwind of death as pretty much every attack is some sort of a spin move. Additionally the way you hold your daggers… makes me actually kinda like wielding daggers. They feel brutal and swift, instead of awkward stabby weapons like daggers feel in so many games. The only problem is that everyone is playing a rogue. This is what every fate looks like practically anywhere in the game right now. 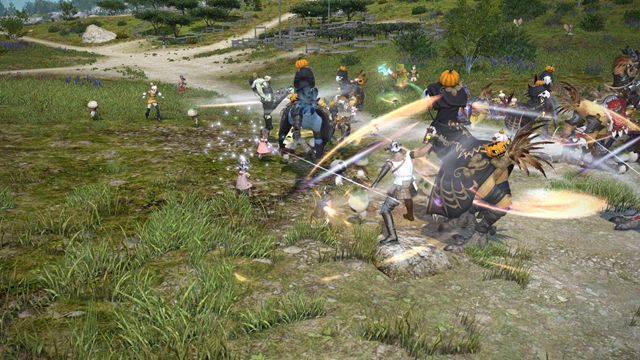 An army of rogues, their chocobos and a blinding flurry of circular slashes as far as the eye can see. As the second shot shows, some rogues have taken to putting Flash on their bar and run around gathering up all of the fate mobs while the rest of us hopelessly chase after them trying to do as much contribution as possible. I remember fates feeling like this at launch, and in reality it is like we have returned to that post launch period at least a bit. Additionally there are a ton of folks out there doing the fates as well trying to farm their Atma pieces, and it seems that the drop rates are in fact reasonable now. I’ve heard tales of folks completing a full set of atmas in a single evening, but I still feel you need to be lucky to make that happen. While I don’t so much care about my rogue, I plan on riding the FATE gravy train with my monk to see just how many levels I can squeeze out. The influx of rogues has lead to some serious madness. I have not actually tried to queue as one, but I saw this tweeted awhile back with someone being stuck in the queue for over 120 minutes. 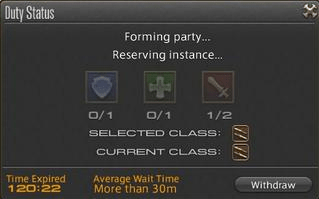 DPS queues previously were 15 to 20 minutes on my server, and the low level roulette queues last night were reporting around an hour. Thankfully none of this madness has hit Syrcus Tower yet, as my dragoon queue there was still near instant last night. I feel like non-ninja dps will have a better shot at getting into dungeons, especially ranged dps since the game tries to match a ranged and a melee for each four man team. In any case if you have a tank or a healer that you plan on leveling, right now is the ideal time to do it. You will get instant queues and probably get the extreme gratitude of the ninjas inside the instance who have been waiting anxiously to do a dungeon. This reminds me of the way Ifrit and Titan were shortly after launch. My friend Tam used to queue doing “community service” as he called it. One time he ran into a poor black mage who had been sitting waiting on Ifrit for 3 1/2 hours. I am not sure if I will do it tonight, but I plan on working on my White Mage to help with the influx of folks queuing for things.